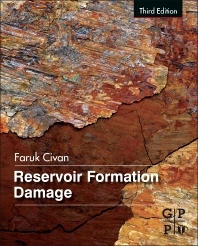 Reservoir Formation Damage, Third Edition, provides the latest information on the economic problems that can occur during various phases of oil and gas recovery from subsurface reservoirs, including production, drilling, hydraulic fracturing, and workover operations. The text helps readers better understand the processes causing formation damage and the factors that can lead to reduced flow efficiency in near-wellbore formation during the various phases of oil and gas production. The third edition in the series provides the most all-encompassing volume to date, adding new material on conformance and water control, hydraulic fracturing, special procedures for unconventional reservoirs, field applications design, and cost assessment for damage control measures and strategies. Faruk Civan is the Martin G. Miller Chair Professor of the Mewbourne School of Petroleum and Geological Engineering at the University of Oklahoma in Norman. He formerly held the Brian and Sandra O’Brien Presidential and Alumni Chair Professorships. Previously, he worked in the Chemical Engineering department at the Technical University of Istanbul, Turkey. Dr. Civan received an Advanced Engineering Degree from the Technical University of Istanbul, Turkey, a M.S. degree from the University of Texas at Austin, Texas, and a Ph.D. degree from the University of Oklahoma, Norman, Oklahoma. All of his degrees are in chemical engineering. Dr. Civan specializes in petrophysics and reservoir characterization; fossil and sustainable energy resources development; carbon sequestration; unconventional gas and condensate reservoirs; reservoir and well/pipeline hydraulics and flow assurance; formation and well damage modeling, diagnosis, assessment, and mitigation; reservoir and well analyses, modeling, and simulation; natural gas engineering, measurement, processing, hydrates, transportation, and storage; carbon dioxide sequestration; coalbed methane production; improved reservoir recovery techniques; corrosion protection in oil and gas wells; filtration and separation techniques; oil and gas processing, transportation, and storage; multiphase transport phenomena in porous media; environmental pollution assessment, prevention, and control; mathematical modeling and simulation, and solving differential equations by numerical methods including by the quadrature, cubature, and finite-analytic methods. Dr. Civan is the author of two books, has published more than 330 technical articles in journals, edited books, handbooks, encyclopedia, and conference proceedings, and presented worldwide more than 125 invited seminars and/or lectures at various technical meetings, companies, and universities. He teaches short industry courses on a number of topics worldwide. Additionally, he has written numerous reports on his funded research projects. Dr. Civan’s publications have been cited frequently in various publications, as reported by the Science Author Citation Index. He is a member of the Society of Petroleum Engineers and the American Institute of Chemical Engineers. and a member of the editorial boards of several journals. He has served on numerous petroleum and chemical engineering, and other related conferences and meetings in various capacities, including as committee chairman and member, session organizer, chair or co-chair, and instructor. Civan has received 21 honors and awards, including five distinguished lectureship awards and the 2003 SPE Distinguished Achievement Award for Petroleum Engineering Faculty and the 2014 SPE Reservoir Description and Dynamics Award.